In the three-phase transformers, the vector group acquires particular importance. 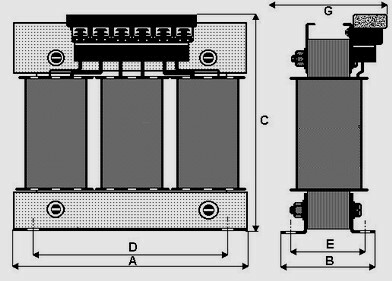 This choice is made according to the type of desired angular displacement between the primary and secondary and the type of load envisaged for the secondary transformer winding. These transformers are manufactured in accordance with the CEI 96-1, CEI 96-2 (EN 60742) and CEI 96-3 (EN 61558-1) standards when the voltage is below 1000 V.
This is one of the most commonly used connections, also adopted for distribution transformers, as it offers all of the advantages relating to the presence of the secondary neutral and none of the disadvantages of the star-star connection. Furthermore, the presence of the delta connection in the primary circuit ensures correct magnetization of the core and a strictly sinusoidal secondary voltage. This presents the disadvantage of not having the neutral in the secondary. From the operational point of view, the triangle-triangle connection offers the possibility of having free circulation of third-harmonic excitation currents without them occurring beyond the terminal block. 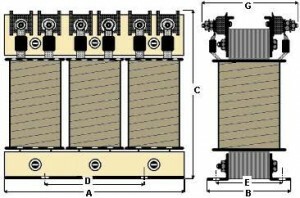 This connection allows for distribution of the load of each phase over two different columns of the magnetic circuit and produces the effect of limiting voltage imbalances due to differences in load in the three phases. Another important characteristic consists in the elimination of the third harmonic from the secondary voltage. Despite the fact the zig-zag connection, having the same voltage, requires a greater number of turns and thus involves greater cost, this is compensated by the advantage of making the transformer more suitable for withstanding unbalanced loads and the advantage of eliminating the third harmonic from the secondary star voltages. Together with the Dy, with neutral, this is used when accessibility of the neutral in the secondary is required and the possibility of strong load imbalances during operation is expected. The third harmonics in the magnetizing current due to non-linearity of the core occur with a current that circulates only in the primary triangle. DESIGNED ACCORDING TO THE SPECIFICATIONS OF THE CLIENT (constructed according to any requirements in technical terms and relating to size). Isolation materials of class F (155°C) and class H (180°C). Compact size, thanks to the use of laminated steel presenting very low loss. Class 1 (requires ground connection). Degree of protection from IP00 to IP10. The metal components are all galvanized. Routine or separate type-based testing on each piece supplied. If required, a printed copy of the test certificate will be issued. The three-phase transformers can be supplied, on request, with ELECTROSTATIC SHIELDS AND THERMOSTATIC SENSORS INSERTED BETWEEN THE WINDINGS. For isolation transformers connected to photovoltaic systems we refer to a magnetic induction value that is lower with respect to that normally used on lines with a regular sine wave. This is to avoid overheating the magnetic metallic sheeting and reduce no-load losses of the transformer, thereby increasing the efficiency of the equipment. The tables below show the indicative dimensions of a transformer with an input voltage between 48 and 650V and an output voltage between 48 and 650V at a frequency of 50-60Hz. DIMENSIONS MAY VARY, DEPENDING ON THE NUMBER OF INLETS, OUTLETS AND INTENSITY OF THE CURRENT (See Technical Notes). MORE DETAILED INFORMATION WILL BE PROVIDED ON RECEIPT OF A SPECIFIC REQUEST. The terminals can be mounted either on one or on two sides of the transformer, depending on the number of voltages and the value of the currents. Dimensions are expressed in mm.